A cross-platform PDF converter, creator, and editor: secure, sign, annotate, redact PDFs & more! Created by Investintech.com Inc.
Able2Extract Professional is a secure, reliable, cross-platform PDF solution for all PDF related tasks in your workflow that saves time and increases productivity. Other features include the ability to fill in PDF forms, create and edit interactive PDFs forms, insert Bates numbering and redact PDF. Add, delete, and format PDF content or modify PDF files by merging and splitting PDFs. Users can insert electronic and digital signatures to PDFs and authenticate digital certificates, as well. One time purchase that cost about $150, and / or subscription that costs about $35 per month. Price may vary depending on commitment and so on. Able2Extract Professional was added by Saki27 in May 2010 and the latest update was made in Mar 2019. The list of alternatives was updated Apr 2019 There is a history of all activites on Able2Extract Professional in our Activity Log. It's possible to update the information on Able2Extract Professional or report it as discontinued, duplicated or spam. PDFelement is an all-in-one PDF editor App provides PDF editing, annotating, converting and signing features on mobile app!. Convert PDF documents to Word, PowerPoint, Excel, JPG and other formats! Secure PDFs, merge documents, add attachments and much more. PDF Conversion Tool allows you to easily and quickly convert almost any file into PDF format and back. PDF Mage lets you save the page you are currently viewing as a PDF file with a single click of a button. This simple tool allows you to convert PDF files into: Word documents (.doc, .rtf), HTML 5, Excel, XML, Text, or JPG, Multipage TIFF, PNG. 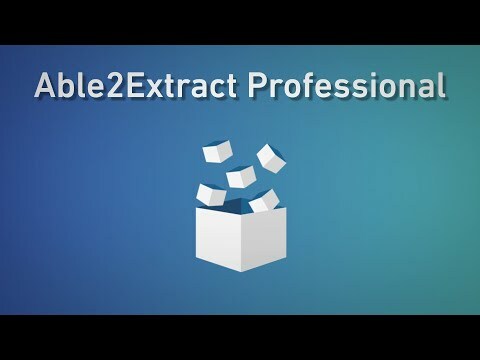 Alternatives to Able2Extract Professional for Windows, Web, Mac, iPhone, iPad and more. Filter by license to discover only free or Open Source alternatives. This list contains a total of 25+ apps similar to Able2Extract Professional. Maybe you want to be the first to submit a comment about Able2Extract Professional? Just click the button up to your right!